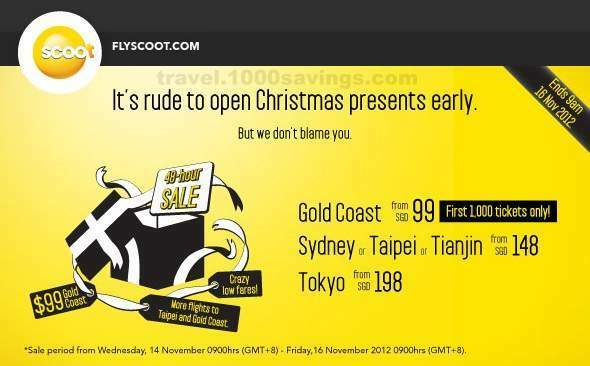 Browse » Home » Tokyo » Scoot to Gold Coast, Sydney, Taipei, Tianjin or Tokyo from RM249! Scoot to Gold Coast, Sydney, Taipei, Tianjin or Tokyo from RM249! Scoot to Gold Coast, Sydney, Taipei, Tianjin or Tokyo from SGD99 (RM249)! For the festive period, we’re giving you more flights to Gold Coast and Taipei at incredibly low fares! What’s more, you could be one of the 1,000 people to fly to Gold Coast for only SGD99 (RM249).